Background: Pain in knee osteoarthritis (OA) may have a neuropathic component. We used the Douleur Neuropathique in 4 questions (DN4) questionnaire to assess neuropathic pain in knee OA and to identify factors associated with neuropathic pain. Methods: A total of 161 patients with knee OA satisfying the American College of Rheumatology 1986 classification criteria for knee OA were prospectively studied. DN4 questionnaire was administered; a score of ≥4/10 was classified as diagnostic for neuropathic pain. The Indian version of Western Ontario and McMaster Universities Osteoarthritis Index (WOMAC) was used to assess pain, stiffness, and physical function. Factors associated with neuropathic pain were explored. Results: Mean age was 55.7 ± 8.8 years. The mean total Indian WOMAC was 75.07 ± 13.8 and WOMAC pain score was 16.1 ± 3.6. Seventy-nine patients of 161 (49%) had DN4 score ≥4 (neuropathic pain present). When diabetics were excluded (n = 58), the proportion of patients with DN4 score ≥4 reduced to 45.6%. The most frequently described pain characteristic was sensation of electric shock (58.4%). Mean total WOMAC and physical function subscale were significantly higher in neuropathic pain group when compared to the group without neuropathic pain (DN4 ≤3), 77.5 ± 11.5 versus 72.6 ± 15.5, P = 0.024 and 54.3 ± 8.8 and 49.8 ± 12.6, respectively, P = 0.008. Conclusions: Neuropathic pain (DN4 ≥4) was seen in up to 49% patients with knee OA. Centrally acting drugs such as tricyclic antidepressants or duloxetine can be used to improve the quality of life and physical function of knee OA patients with neuropathic pain. Osteoarthritis (OA), a degenerative loss of articular cartilage causing subchondral sclerosis and joint deterioration, is the most common cause of arthritis in the general population in India. The most common joint involved is knee followed by hip. Although the origin of pain in OA is not well understood, it is generally believed to be nociceptive because of local structural pathology and joint failure which so characterizes OA. Pain is also attributed to be due to the release of inflammatory mediators into the joint which secondarily sensitizes peripheral afferent nerves. However, there is often a discordance between the radiographic knee OA and pain, suggesting that the pain can be contributed by other mechanisms other than nociception. According to the International Association for the Study of Pain (IASP), neuropathic pain is a “clinical syndrome with varied etiology arising as a consequence of a lesion or disease affecting neurosensory system.” Diagnosis depends on a good history, clinical neurological examination, and sensory testing. IASP also recommends screening tools to differentiate neuropathic pain from nonneuropathic pain. There are several tools to assess neuropathic pain. For this study, the definition of neuropathic pain was done using Douleur Neuropathique in 4 questions (DN4) a questionnaire developed by the French Neuropathic Pain Group. Although knee OA is commonly seen in our setting, causing functional morbidity and extreme pain, the aspect of neuropathic pain in knee OA has not previously been studied in India. Therefore, we set out to study this aspect of OA with the objective to assess the level of neuropathic pain in patients with knee OA and identify the clinical and sociodemographic factors associated with neuropathic pain. We conducted a cross-sectional study in the medicine and orthopedic outpatient department (OPD) of a tertiary care center located in Southern India. Data collection period was for 2 months (June and July 2016). Patients with knee OA (age >18 years) satisfying the American College of Rheumatology (ACR) 1986 classification criteria for primary knee OA , were included in the study. Those who had OA secondary to diseases such as rheumatoid arthritis or trauma were excluded from the study. Knee OA was defined by the ACR clinical classification criteria for knee OA. Patients already having a diagnosis of knee OA (and fulfilled the ACR criteria) were invited to participate in the study. Clinical examination included measurement of height, weight, and body mass index (BMI). We performed clinical examination of both knees to look for the presence or absence of joint line tenderness, swelling, effusion, bony hypertrophy/enlargement, and crepitus. Plain radiographs of the both knees anteroposterior and lateral view were taken and graded for OA using Kellgren–Lawrence (K-L) grading for OA. There are several tools recommended by the IASP to assess neuropathic pain. For this study, we defined neuropathic pain by DN4 which is a questionnaire developed by the French Neuropathic Pain Group to differentiate somatic from neuropathic pain. It consists of four main questions which involve interview of patient (question 1 and 2) and physical examination of the patient (question 3 and 4). Question 3 involves testing for touch and pinprick hypoesthesia, respectively. Touch and pinprick sensation was tested in the region around both the knees using cotton wool and a pin, respectively. Any reduction in perception to cotton wool and pinprick was taken as the presence of touch hypoesthesia and pricking hypoesthesia, respectively. For question no. 4, “In the painful area, can the pain be caused or increased by brushing,” brushing was tested using a soft brush. This question basically helps to assess the presence or absence of allodynia. In summary, DN4 questionnaire has four main questions, and in total, there are ten questions. A score of 4/10 or greater has a sensitivity of 83% and specificity of >90% for neuropathic pain diagnosis. We also used this cutoff of DN4 of 4/10 to diagnose neuropathic pain. DN4 has a higher diagnostic accuracy when compared to other questionnaire such as the painDETECT because of the presence of physical examination in the score. The English questionnaire was translated to the local language by an expert medical translator. This local language version was retranslated to English to see if the contents matched. After this, content validation of the local language questionnaire was done on an initial sample of twenty patients to test whether the questions conveyed the message correctly to the patient. The questionnaire was administered to the patient by author VNR, and clinical examination was confirmed by author MMT. Sample size was estimated at 171, calculated using the statistical formula for estimating the population mean of neuropathic pain (DN4 questionnaire) as 6 with a standard deviation (SD) of 2. Sample size was estimated at 5% level of significance and 5% relative precision. The distribution of data on categorical variables was expressed as frequency and percentages. Continuous data were expressed as mean ± SD or median with range, depending on the normality of data. Comparison of categorical variables between groups was explored by Chi-square test or Fisher's exact test (as appropriate). The comparison of continuous variables between groups was carried out using independent Student's t-test or Mann–Whitney U test based on the normality of data. All analyses were carried out at 5% level of significance and P < 0.05 was considered statistically significant. Statistical analysis was carried out using SPSS Statistics for windows version 19 (IBM Corporation, Armonk, New York, USA). All participants gave informed written consent and the study protocol was approved by the Institute Ethics Committee. We studied 171 patients with suspected knee OA, ten patients were excluded because one patient turned out to have rheumatoid arthritis, another patient had pain in knee due to claudication and did not fulfill criteria for OA, one patient had hip pain and low back pain but no knee OA, and the remaining seven patients had symptoms of OA, but the duration of knee pain was less than a month. In total, 161 patients with confirmed knee OA were included in the study. There were 52 males and 109 female patients; the mean age of the patients was 55.7 ± 8.8 years; 149 out of the 161 patients, i.e. 92.5% were from rural areas; 155/161 (96.3%) participants were educated only up to primary school, whereas six patients (3.7%) were illiterate (never got school education). Majority of patients recruited from the medicine OPD never had received the diagnosis of OA before. These patients had knee OA, but the knee pain had never been addressed to. The baseline characteristics of the study participants are shown in [Table 1]. Eighty-seven percent patients had OA of both the knees, whereas 13% had single knee OA. Majority patients 129/161 (80%) were having mild OA, i.e. K-L Grade 0, 1, and 2, whereas the rest were moderate to severe OA (K-L Grade 3 and 4) [Table 2]. Only 36% patients had received (prescribed) medications for pain relief earlier. In patients who had both knee OA, the WOMAC index was scored for the worse knee. With the possible range from 0 to 20, the mean WOMAC pain score was 16.1 ± 3.6. [Table 2] shows the results of the WOMAC scores for stiffness, physical function, and the score for optional questions. The mean DN4 in the study patients was 3.53 ± 1.63. Seventy-nine of 161 (49.1%) had DN4 of ≥4, i.e. neuropathic pain was present. Eighty-two patients out of 161 (50.9%) had a DN4 ≤3 (neuropathic pain was absent). The most frequently described neuropathic pain characteristic was a sensation of electric shock in 58.4% patients, followed by painful cold in 35.4% and burning pain in 32.3%. Symptom of pins and needles was reported by 79.5% and numbness in 61.5% patients. Very few patients reported tingling and itching sensation [Table 3]. On physical examination, up to 46% (74/161) had decreased touch sensation (touch hypoesthesia), whereas decreased sensation to pinprick (pricking hypoesthesia) was seen in only 21.7% [Table 3]. When patients with diabetes were excluded (n = 58), the proportion of patients with DN4 score ≥4 reduced to 45.6% (i.e. 47/103). Comparison of the clinical features, WOMAC scores between Group 1 - DN4 ≤3 (no neuropathic pain) with Group 2 - DN4 ≥4 (neuropathic pain) are presented in [Table 4]. There was no difference in age, gender, height, weight, and BMI between the two groups. There were more diabetic patients in the neuropathic pain group when compared to no neuropathic pain group; 32 versus 26 patients, respectively, however, the result was not statistically significant, P = 0.25. 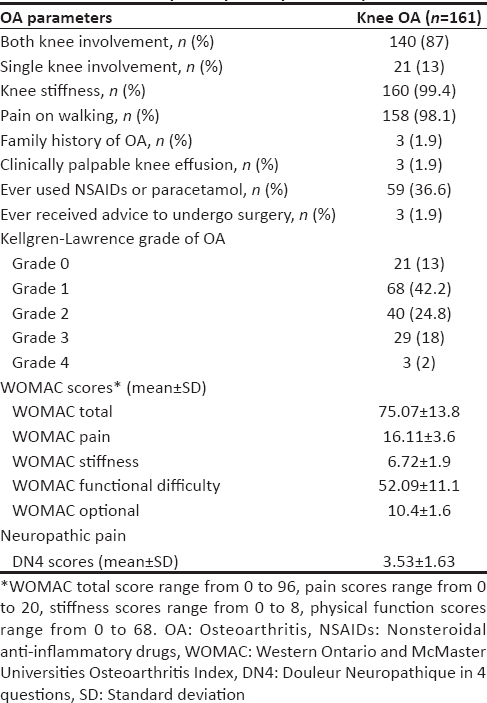 The mean total WOMAC scores were significantly higher in the neuropathic pain group when compared to the group with no neuropathic pain; 77.5 ± 11.5 versus 72.6 ± 15.5, respectively, P = 0.024. Patients who were in the neuropathic pain group had a significantly worse physical function as measured by a higher WOMAC physical function subscale score compared to no neuropathic pain group; 54.3 ± 8.8 versus 49.8 ± 12.6, respectively, P = 0.008. The scores related to pain, stiffness, and the optional questions were similar in the two groups. The correlation of DN4 score with age and different components of WOMAC was done using Spearman's rank correlation test [Table 5]. We found that WOMAC total score (r = 0.177) and WOMAC functional difficulty score (r = 0.18) have significant positive correlation (P< 0.05) with DN4 scores. Age, BMI, and other WOMAC subscale were not found to be significantly correlated with DN4 scores. There was also no association of the grade of OA with neuropathic pain. Sixty-six of 129 patients (51.2%) with mild OA (i.e., K-L Grade 0, 1, and 2) had neuropathic pain compared to 16 of 32 patients (50%) with moderate-to-severe OA (K-L Grade 3 and 4), P=1. In the last decade, it is recognized that the cause of pain in OA may not arise only from the joint but may be contributed by a neuropathic component because of central sensitization.,,, In this study, we found that nearly 49% of our patients of knee OA have neuropathic pain as defined by a DN4 score of 4/10 or more. A large community-based study from Spain showed that 52% (1125/2167) patients with painful knee OA had neuropathic pain. When patients with potential confounders were excluded, the prevalence of neuropathic pain reduced to 33%. In this Spanish study, authors used the DN4 questionnaire to diagnose neuropathic pain. Another community-based study from Canada found that 28% (48/171) patients with knee OA had neuropathic pain. In the Canadian study, the authors modified the painDETECT questionnaire to enquire about neuropathic pain; they mailed the questionnaires to 259 participants, of which 171 responded. PainDETECT consists of nine items, when the summation of scores of these nine items is above 19, the diagnosis of neuropathic pain is likely. However, DN4 has better diagnostic accuracy when compared to painDETECT because of the presence of physical examination in the score. Another recent study from the UK used the painDETECT and Leeds assessment of neuropathic symptoms and signs scale form to enquire about neuropathic pain and found neuropathic pain in 27% of 179 respondents. In this study, another major finding was the painDETECT correlates very well with signs of central sensitization. We used the DN4 questionnaire as it was simple to use, easy to score, and it was easily translated to the local language. It appears that our findings are similar to the published literature although the prevalence of neuropathic pain, we found among our patients was quite high (49%). There were 58 (36%) diabetic patients in our study group. Presence of diabetes, which is a major cause of peripheral neuropathy, forms a major confounder in our study. However, even after we excluded the patients with diabetes from the analysis, neuropathic pain was still seen in 47/103, i.e., 45% patients. Of note is that all our patients were from a rural background, lacked formal education, were socioeconomically deprived, and only 36% were ever treated with analgesics/anti-inflammatory. Whether these factors can explain the higher scoring on DN4 remain to be explored (in our setting). In other population, patients are taught pain coping strategies, etc., which practically does not exist in our system. It has been shown in an elegant study that patients with higher self-efficacy for pain control have a higher tolerance for thermal pain stimuli. The second important finding of our study was the mean WOMAC (CRD Pune version) total, and physical functional (disability) score was higher in patients with neuropathic pain symptoms. This finding was expected and has been seen in previous studies. This finding may be a reflection of structural damage of OA contributing to neuropathic pain; the functional disability further amplifies the nociceptive stimuli by central mechanisms resulting in neuropathic pain. Pain in OA is (most commonly) attributed to be stimulation of nociceptors located in the joint, namely, joint capsule, ligaments, synovium, bone, and menisci. These structures are stimulated when there are structural damage and chronic inflammation (secondary inflammation is commonly seen in OA). This is the reason why acetaminophen (paracetamol) and nonsteroidal anti-inflammatory drugs may reduce synovitis in OA. Animal studies also show increase in local production of nitric oxide (NO) by the degraded cartilage which is suppressed by hyaluronan. However, relationship of OA pain with structural damage of the joint is not always linear. The most damaged joint may not always produce excess pain., There is often a discordance between structural damage and pain which can be explained by central mechanisms such as abnormal central processing of sensory stimuli and hyperexcitability as has been reviewed earlier.,, Patients with painful hip OA have abnormal sensory perception in the form of increased sensitivity to pressure pain, warmth, cold pain, and heat which decreased after surgery, thereby indicating that the abnormal sensory testing was initiated and maintained by chronic nociception. Recent studies also show that OA patients who have indications for knee replacement have significantly lower pain pressure thresholds which correlated with poor quality of life and poor functional ability. Central sensitization is a phenomenon which depends on the persistent transmission of local nociceptor stimulation to the dorsal horn of the spinal cord. This stimulation leads to depolarization of the dorsal horn neurons, influx of extracellular Ca2+, and production of NO, in turn promoting the release of substancePresulting in hyperexcitability. Pain augmentation by central sensitization occurs in many chronic pain conditions, of which OA is one of them. Due to central sensitization, patients with OA (as in other chronic pain conditions) perceive even ordinary activities such as walking as painful (allodynia)., Central sensitization is clinically reflected as neuropathic pain., In an earlier study comprising eighty OA patients, 34% participants had neuropathic pain symptoms and used a range of terms to describe the quality of knee pain ranzging from spontaneous feeling of electric shock-like sensation, burning, tingling to evoked, i.e., pain on light touch. There is growing body of evidence that patients with OA have a pain which is neuropathic in quality which may explain poor response to analgesics and anti-inflammatory agents. Our study had many limitations. Neuropathic pain has been defined by DN4 questionnaire which is mainly based on clinical symptoms and physical examination. However, current recommendations for the assessment of neuropathic pain also still rely on history and examination. It would be ideal to confirm by tests for sensory perceptions such as a quantitative sensory testing. The second limitation is we have not assessed for psychological factors such as levels of anxiety or depression which may contribute or confound neuropathic pain. The third is we have not assessed for central sensitization by measuring pain pressure thresholds. We conclude that here is a high prevalence of neuropathic pain as assessed by DN4 questionnaire among patients with knee OA in a tertiary care center located in Southern India. The findings of this study imply that centrally acting drugs such as tricyclic antidepressants, duloxetine, and gabapentin (all approved agents for the treatment of neuropathic pain) can be used in OA pain to improve the quality of life and functional ability. We sincerely thank Dr. Arvind Chopra, Centre for Rheumatic Diseases, Pune, Maharashtra, India, for granting permission to use the WOMAC CRD Pune version. Sharma R, editor. Epidemiology of Musculoskeletal Conditions in India. New Delhi, India: Indian Council of Medical Research; 2012. Hunter DJ, McDougall JJ, Keefe FJ. The symptoms of osteoarthritis and the genesis of pain. Rheum Dis Clin North Am 2008;34:623-43. Hannan MT, Felson DT, Pincus T. Analysis of the discordance between radiographic changes and knee pain in osteoarthritis of the knee. J Rheumatol 2000;27:1513-7. Havelin J, Imbert I, Cormier J, Allen J, Porreca F, King T. Central sensitization and neuropathic features of ongoing pain in a rat model of advanced osteoarthritis. J Pain 2016;17:374-82. Hochman JR, Gagliese L, Davis AM, Hawker GA. Neuropathic pain symptoms in a community knee OA cohort. Osteoarthritis Cartilage 2011;19:647-54. Oteo-Álvaro Á, Ruiz-Ibán MA, Miguens X, Stern A, Villoria J, Sánchez-Magro I. High prevalence of neuropathic pain features in patients with knee osteoarthritis: A cross-sectional study. Pain Pract 2015;15:618-26. Moreton BJ, Tew V, das Nair R, Wheeler M, Walsh DA, Lincoln NB. 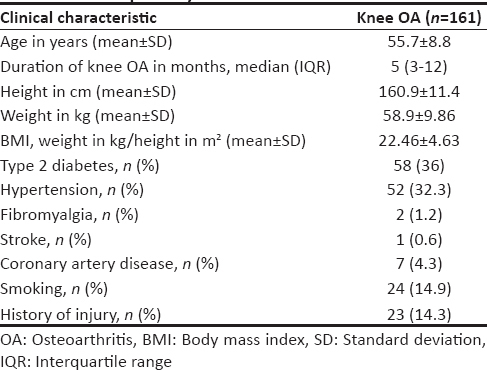 Pain phenotype in patients with knee osteoarthritis: Classification and measurement properties of painDETECT and self-report Leeds assessment of neuropathic symptoms and signs scale in a cross-sectional study. Arthritis Care Res (Hoboken) 2015;67:519-28. Hochman JR, Davis AM, Elkayam J, Gagliese L, Hawker GA. Neuropathic pain symptoms on the modified painDETECT correlate with signs of central sensitization in knee osteoarthritis. Osteoarthritis Cartilage 2013;21:1236-42. Parks EL, Geha PY, Baliki MN, Katz J, Schnitzer TJ, Apkarian AV. Brain activity for chronic knee osteoarthritis: Dissociating evoked pain from spontaneous pain. Eur J Pain 2011;15:843.e1-14. Treede RD, Jensen TS, Campbell JN, Cruccu G, Dostrovsky JO, Griffin JW, et al. Neuropathic pain: Redefinition and a grading system for clinical and research purposes. Neurology 2008;70:1630-5. Cruccu G, Truini A. Tools for assessing neuropathic pain. PLoS Med 2009;6:e1000045. Bouhassira D, Attal N, Alchaar H, Boureau F, Brochet B, Bruxelle J, et al. Comparison of pain syndromes associated with nervous or somatic lesions and development of a new neuropathic pain diagnostic questionnaire (DN4). Pain 2005;114:29-36. Altman R, Asch E, Bloch D, Bole G, Borenstein D, Brandt K, et al. Development of criteria for the classification and reporting of osteoarthritis. Classification of osteoarthritis of the knee. Diagnostic and Therapeutic Criteria Committee of the American Rheumatism Association. Arthritis Rheum 1986;29:1039-49. Kellgren JH, Lawrence JS. Radiological assessment of osteo-arthrosis. Ann Rheum Dis 1957;16:494-502. Bellamy N, Buchanan WW, Goldsmith CH, Campbell J, Stitt LW. Validation study of WOMAC: A health status instrument for measuring clinically important patient relevant outcomes to antirheumatic drug therapy in patients with osteoarthritis of the hip or knee. J Rheumatol 1988;15:1833-40. Chopra A, Lavin P, Patwardhan B, Chitre D. A 32-week randomized, placebo-controlled clinical evaluation of RA-11, an Ayurvedic drug, on osteoarthritis of the knees. J Clin Rheumatol 2004;10:236-45. Freynhagen R, Baron R, Gockel U, Tölle TR. painDETECT: A new screening questionnaire to identify neuropathic components in patients with back pain. Curr Med Res Opin 2006;22:1911-20. Keefe FJ, Lefebvre JC, Maixner W, Salley AN Jr., Caldwell DS. Self-efficacy for arthritis pain: Relationship to perception of thermal laboratory pain stimuli. Arthritis Care Res 1997;10:177-84. Felson DT. The sources of pain in knee osteoarthritis. Curr Opin Rheumatol 2005;17:624-8. Brandt KD, Mazzuca SA, Buckwalter KA. Acetaminophen, like conventional NSAIDs, may reduce synovitis in osteoarthritic knees. Rheumatology (Oxford) 2006;45:1389-94. Takahashi K, Hashimoto S, Kubo T, Hirasawa Y, Lotz M, Amiel D. Hyaluronan suppressed nitric oxide production in the meniscus and synovium of rabbit osteoarthritis model. J Orthop Res 2001;19:500-3. Kosek E, Ordeberg G. Abnormalities of somatosensory perception in patients with painful osteoarthritis normalize following successful treatment. Eur J Pain 2000;4:229-38. Imamura M, Imamura ST, Kaziyama HH, Targino RA, Hsing WT, de Souza LP, et al. Impact of nervous system hyperalgesia on pain, disability, and quality of life in patients with knee osteoarthritis: A controlled analysis. Arthritis Rheum 2008;59:1424-31. Bradley LA. Recent approaches to understanding osteoarthritis pain. J Rheumatol Suppl 2004;70:54-60. Hochman JR, French MR, Bermingham SL, Hawker GA. The nerve of osteoarthritis pain. Arthritis Care Res (Hoboken) 2010;62:1019-23. Dimitroulas T, Duarte RV, Behura A, Kitas GD, Raphael JH. Neuropathic pain in osteoarthritis: A review of pathophysiological mechanisms and implications for treatment. Semin Arthritis Rheum 2014;44:145-54. Cruccu G, Sommer C, Anand P, Attal N, Baron R, Garcia-Larrea L, et al. EFNS guidelines on neuropathic pain assessment: Revised 2009. Eur J Neurol 2010;17:1010-8. Dworkin RH, O'Connor AB, Audette J, Baron R, Gourlay GK, Haanpää ML, et al. Recommendations for the pharmacological management of neuropathic pain: An overview and literature update. Mayo Clin Proc 2010;85 3 Suppl:S3-14.